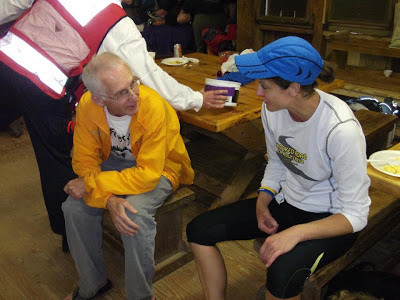 I first had the pleasure of meeting Amy at the August Umstead series which I was in charge of back in 2009. A group of us met for dinner as usual after the run and the conversation of course was mostly about running and what events we had recently finished and had scheduled for later. She had run a couple of trail half marathons in respectable times considering the courses. Now she was in training to run her first marathon later that Fall. I think she was a bit surprised to find that half the folks she was sitting with were very experienced at marathons and ultra's. We got to know each other a little bit over the next few weeks and then one day she asked if it would be ok to join Karla and I on one of our long runs. I'm not one to usually say no to a pretty lady so I said she was welcome to meet with us. So, on Saturday Oct 17, we met for a long run at Umstead. Amy had never gone more than 15 miles and her marathon was just 3 weeks away so this was going to be a challenge for her. We began at an easy pace and were having a great time but after about 13 miles in she began to struggle a bit and we would have to slow and wait for her. This happened a few times so as Karla and I headed up Powerline for the last time, Amy fell behind again. Just before we got to the end however there she was working hard to catch back up. 20.7 miles on a very difficult course which we ran faster for the 2nd half and she was giving it all she had. I knew then that there was something special about her and definitely Angel material. I decided soon after that I would go to the marathon and run the last part of the race with her at City of Oaks. Race day turned out to be a miserably rainy cold and windy mess as I watched the race from a couple of different spots. I estimated when she might be coming out of Umstead and began running backwards on the course and finally met her just as she exited the park at mile 19. The rain had stopped and was now just an off and on sprinkle as I began to run with her. She was tired but in good spirits and moving along at a decent pace. Over the next several miles I tried to keep her entertained just like when I run with Karla, even singing to her to keep the mood light and take her mind off the work still ahead. I could tell she was hurting but she was determined to keep running and as we neared the last miles I saw once again first hand the toughness and determination that makes her so special. And after she crossed the finish line and met her family I got to see the true nature of her sweet spirit as she held her then 3 year old Ashlynn in her arms and crying. I just walked away to give them their special moments as a family, knowing that yes, she was truly someone special. After the race she joined several of us for another long run but then other things were going on and she wasn't focused on another race for awhile so we didn't run anymore but would just see each other at other NCRC events. 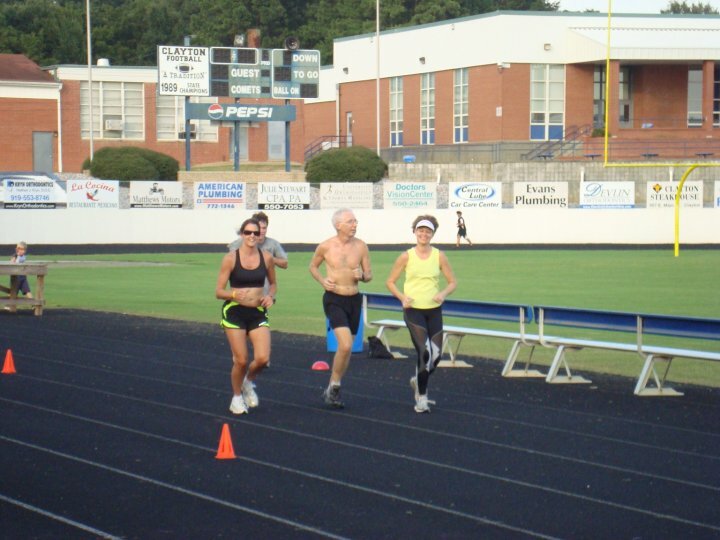 Then in August of 2010 as Karla and I were beginning to run on the track in preparation for the Boston marathon among other things, Amy asked if she could join us on the track. I don't think she had been doing a lot of running over the summer and at first it was hard for her to keep up with us. She would fall behind but still give 100%. After several repeats she might need to sit one out but then she would be right there trying again. Over the next few weeks she would continue to go and push herself to the limit showing me time and again the grit and determination that I had grown to love and admire in her. In no time she was not only keeping up with us on the workouts but hanging right with us and pushing the pace. I noted after our Sept 20th workout that Amy had improved a lot. By now she was joining in on most of our weekend long runs and this would continue on up to this day. That November Amy would move to the Darkside and run her 1st 50k at Derby. I would have loved to have run it with her but I was trying to go for a pr. By now we were running together on a pretty regular basis and our friendship had grown as well. A few months later she asked me if I thought doing "The Boogie" as her first 50 miler was a good idea. Without hesitation I told her yes. At this point let me explain, that Amy had run very well and done some very good races on very limited mileage. Due to her family obligations, job and volunteer work at church, she was lucky to get in 3 runs a week so I knew she had great potential. Lots of folks thought it was a bad idea for her to try and run Boogie but after all the running I had done with her and getting to know her as well as I do, I never had any doubts that she would not only finish it but do well. And I was proven right as I ran a course pr and she was only a couple of minutes behind me and running strong. I was a little surprised when she told me soon after that she wanted to run the Umstead 100 the following April. We had talked about her running it someday but I had suggested she wait until 2013 and give herself more time to build up her mileage but once she made up her mind I knew she was going to do it so I just told her I'd help get her ready the best I could. I must say I was a bit disappointed too because I had hoped she would run a lap with me since I was running it and planned on letting all my Angels share a lap if they could. Over the Fall and Winter we continued to run a lot together with Karla and Lisa and Jenn. Amy went to a 24 hour race in Virginia and despite sub freezing temperatures put in a very respectable distance of 83 miles which would go a long ways in showing her what she had to expect at Umstead. 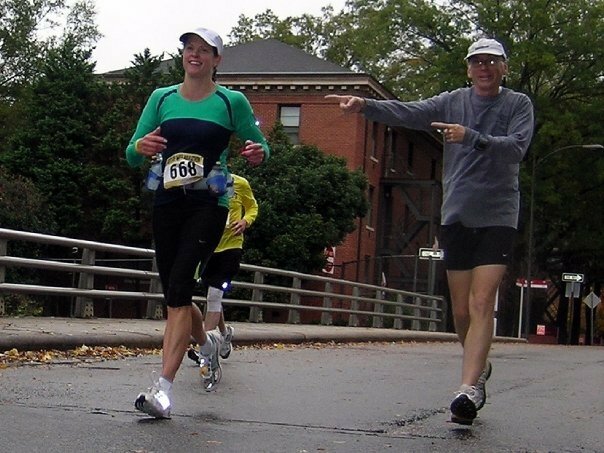 As Umstead rolled around on March 31st 2012, I once again had no doubt that she was going to finish. I knew she was probably going to suffer more than I would want to see due to her low overall mileage but I was going to support her in anyway I could. We started off together for a couple of miles but then I had to say goodbye since I was going for a pr and she just wanted to finish. I think she really wanted a sub 24 but that would have been very difficult. I know she has the potential to run much faster than that but not on 20 miles a week. It did turn out to be a tough day for both of us. By the mid point she was really hurting and having major blister issues. I got to see her a few times on the out and back portions and I would stop and just give her a hug and some encouragement. I hated to see her in such pain but I also knew there was no quit in her. After I finished I calculated about when to expect her to finish and took a nap and had several people make sure that I was up in time to see her finish. Seeing her come up that last little hill to the finish was a very emotional moment knowing that she had really suffered out there but nothing was going to stop her. In case you haven't figured it out yet, I am extremely proud of her for what she has accomplished as well as just the person and friend that she is. Stay tuned for part 2 and the road to Boston !